Step inside your private North Myrtle Beach rental at Carolina Dunes and admire all the creature comforts of home. From a fully furnished kitchen with full-size appliances to the washing machine and clothes dryer that each of these condos in North Myrtle Beach, SC includes, your family will be right at home. Take it easy in the living room and watch a movie on your DVD player as most of these North Myrtle Beach rentals contain more than one television and at least one DVD player. For a nice distraction, go outside to the oceanfront balcony and sit a while. There is nothing like relaxing early in the morning with your cup of coffee and postcard-perfect views of the Atlantic Ocean. Whether your family stays on the second floor or the sixth floor of this North Myrtle Beach resort, the views are fantastic. 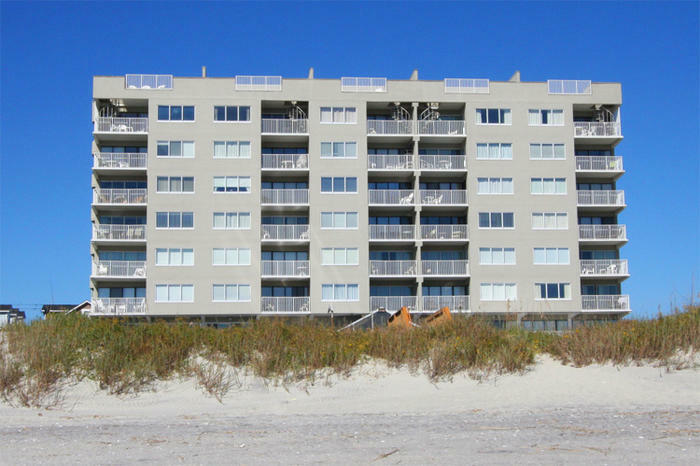 Furthermore, the condominiums in North Myrtle Beach, South Carolina at Carolina Dunes all have high-speed Internet access. Bring your laptop computer and log onto the Internet in the privacy and comfort of your North Myrtle Beach rental. Having the Internet at your fingertips is a blessing when you want to plan your North Myrtle Beach vacation day. You can check out the nearby attractions and see online menus of nearby restaurants. Want to make a tee time? Get online and do it! Look for sales, store hours and online coupons for the nearby shopping venues and peruse the calendars of events for all the local live entertainment theatres and concert halls around North Myrtle Beach, South Carolina. Myrtle Beach and North Myrtle Beach are brimming with fabulous ways to spend your North Myrtle Beach vacation days. Hanging out on the beach offers a myriad of recreational opportunities, from building sand castles and taking long walks to snorkeling and riding the waves. But there is much more to do around town. Miniature golf courses dot the landscape. Play 18 holes of putt-putt with the kids every day of your stay. Ride a zip line at Broadway at the Beach. Get on the Myrtle Beach SkyWheel for panoramic views of the ocean and Myrtle Beach landscape from way up high in the sky. Go to a water park and venture down a speeding water slide. Ride a roller coaster at Family Kingdom Amusement Park. Admire the award-winning sculptures at Brookgreen Gardens. There are hiking trails and bike lanes around town and the fishing piers are a great way to jumpstart your day—go for a walk to the very end and back. Myrtle Beach is famous for its live entertainment theatres and there are a good number of them from which you can choose. See a show at The Carolina Opry or watch the antics in a lagoon and aboard a ship during the Pirates Voyage. The Alabama Theatre combines singing, dancing and comedy for a memorable evening that kids and adults alike will enjoy. Medieval Times is a dinner theatre where the show involves jousting knights and beautiful horses. House of Blues is even in close proximity to Carolina Dunes and so it behooves you to check out their lineup of concerts for the days you will be in town. You never know, your favorite bands could be playing there! There are more than 1,500 restaurants in the Myrtle Beach area which means your family will have quite a selection when it comes to dining choices. There is fine dining and casual dining. Waterfront dining, outside dining and riverfront dining are all available in North Myrtle Beach, South Carolina. Dine on a boat, at a marina, along the Marshwalk or on a fishing pier. It is all here for your North Myrtle Beach vacation.